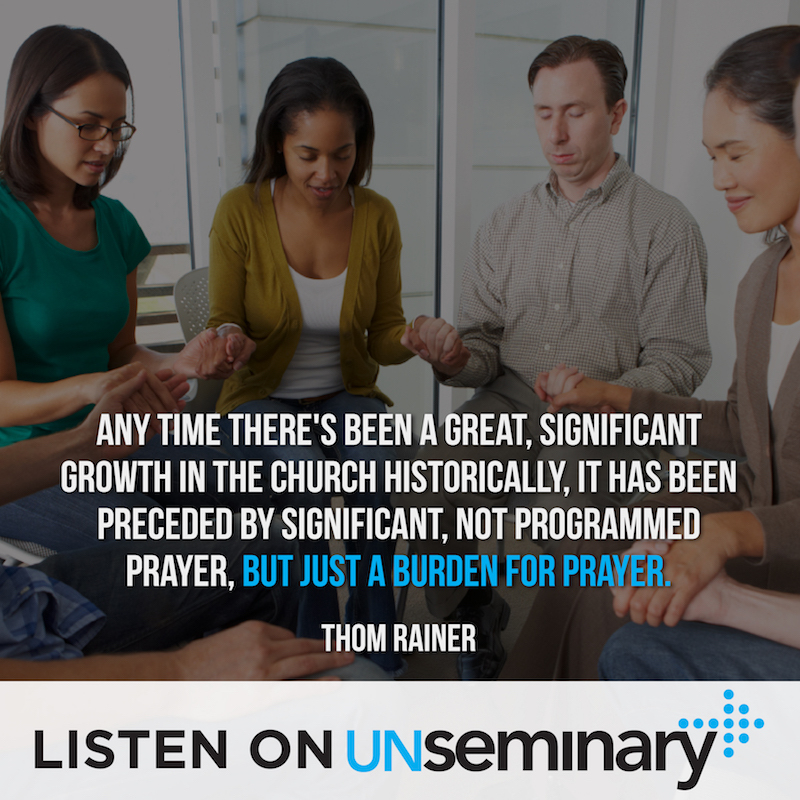 Thanks for joining us for this week’s episode of the unSeminary podcast. I’m excited to have Dr. Thom Rainer, president and CEO of LifeWay Christian Resources, for this episode. Thom has written over two dozen books, has a great blog and podcast, and we’re very excited to have him with us today. Thom started out as a fifth generation banker after college, but he left the banking world in his late twenties to pursue a call to ministry. That path led him from the fast-track corporate world to being unemployed as he stepped out to attend seminary. Thom did serve four different pastorates after seminary, but then his school asked him to become a dean. This change in careers eventually led him to working for LifeWay, the largest Christian company in the world. Thom is with us for this episode to talk about the current state and future of churches and share some of his wisdom and insight. Pastors and staff need to be equipped with leadership and relational skills. // Thom notes that one of the big challenges for pastors and staff today is that they have not been equipped to handle the business and people management side of church. “A lot of our pastors,” Thom says, “a lot of our staff persons—and this is not any type of denigrating statement, they say this—‘I have not been trained to lead a church with a quarter million dollar budget, a half a million dollar budget. I have not been trained to lead multiple staff. I don’t know how to deal with the person that’s constantly on my case.” At the very least these daily issues can distract pastors from their main focus. As Thom explains, these challenges are why practical ministry leadership tools and resources are so valuable and necessary for today’s church leaders. Be intentional about reaching out. // While researching one of his books, Thom found that only 5% of people are resistant to an invitation to church, the other 95% are either receptive or neutral. Pastors need to be reaching out to their communities in order to build real relationships. Thom notes that the millennial generation “has taught me that true ministry, true evangelism, that has credibility and integrity behind it, is built upon relationships, is built upon connecting with other people.” Look for ways to get to know your community and partner with them. Ask people what is going on in their lives and really listen. Show them what’s different about your church and provide a clear gospel message they can relate to when they step through your doors. 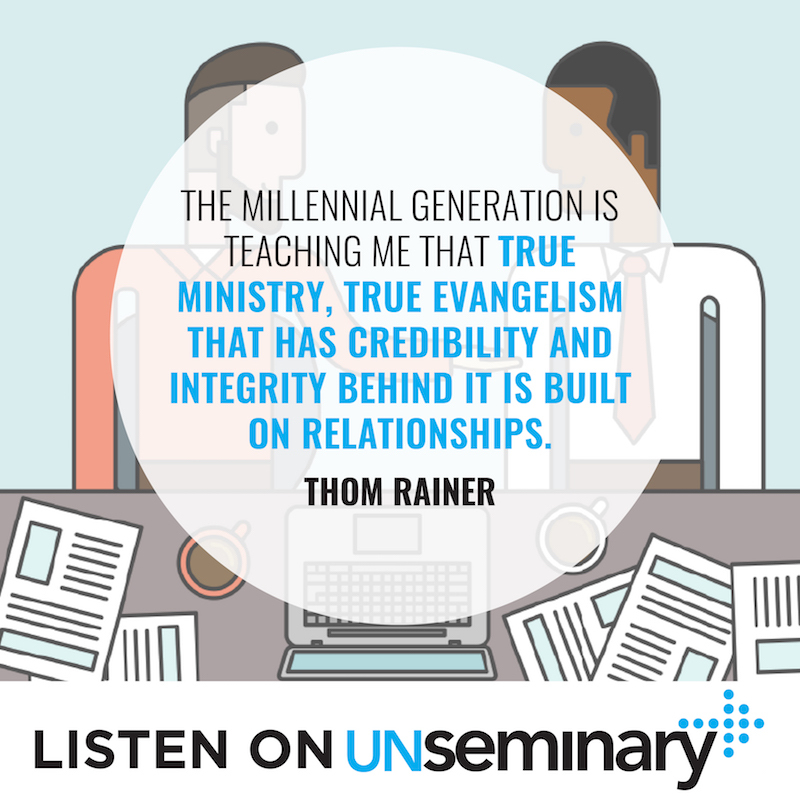 You can learn more about Thom and his work at ThomRainer.com and also find his podcast, Rainer on the Leadership, there. There are a lot of podcasts you could be tuning into today, but you chose unSeminary, and I’m grateful for that. If you enjoyed today’s show, please share it by using the social media buttons you see at the left hand side of this page. Also, kindly consider taking the 60-seconds it takes to leave an honest review and rating for the podcast on iTunes, they’re extremely helpful when it comes to the ranking of the show and you can bet that I read every single one of them personally! Lastly, don’t forget to subscribe to the podcast on iTunes, to get automatic updates every time a new episode goes live! 00:37 // Rich introduces Thom Rainer and welcomes him to the show. 01:42 // Thom tells us his history. 04:26 // Thom makes reference to his book, The Unchurched Next Door. 07:43 // Thom talks about how churches connect with the community, without compromising the message of Christ. 09:57 // Thom talks about today’s trend. 10:55 // Thom shares an insight on his mistakes in his ministry career. 14:20 // Thom talks about the church leaders he finds inspirational. 17:27 // Thom offers his contact details. 18:07 // Thom closes with a message to other church leaders. Rich – Well hey everybody, welcome to the unSeminary podcast, thank you so much for listening in. My name’s Rich, the host around parts. I know that you’re really busy at your church, you’ve got a lot going on this week as we head into the weekend and I’m just so thankful that you would take some time out, to listen in and today, we’ve got a real treat. Our guest on the show today is Dr. Thom Rainer, he is the president and CEO of LifeWay Christian Resources. You’ve probably heard of Thom before, so he doesn’t need a huge introduction. He’s written over two dozen books, on top of that he’s got a great blog, an incredible podcast, welcome to the show doctor. Thom – Well doctor is absolutely not necessary. Rich this is supposed to be unSeminary, so let’s do away with the titles and let your audience hear from Thom and not doctor. The only person that calls me doctor is my wife and she calls me, Most Holy Reverend Doctor. Other than that let’s just keep it Thom. Rich – Does she call you Most Holy Reverend Doctor when you have to take out the garbage, is that what’s going on? Thom – That’s when she wants me to take out the garbage. She’s a really submissive wife and I listen to her carefully. So whenever she tells me to do something, I do it. Rich – Nice, very good, fantastic. Well Thom, for people who don’t know you, why don’t you give us the kind of a one minute Thom story? 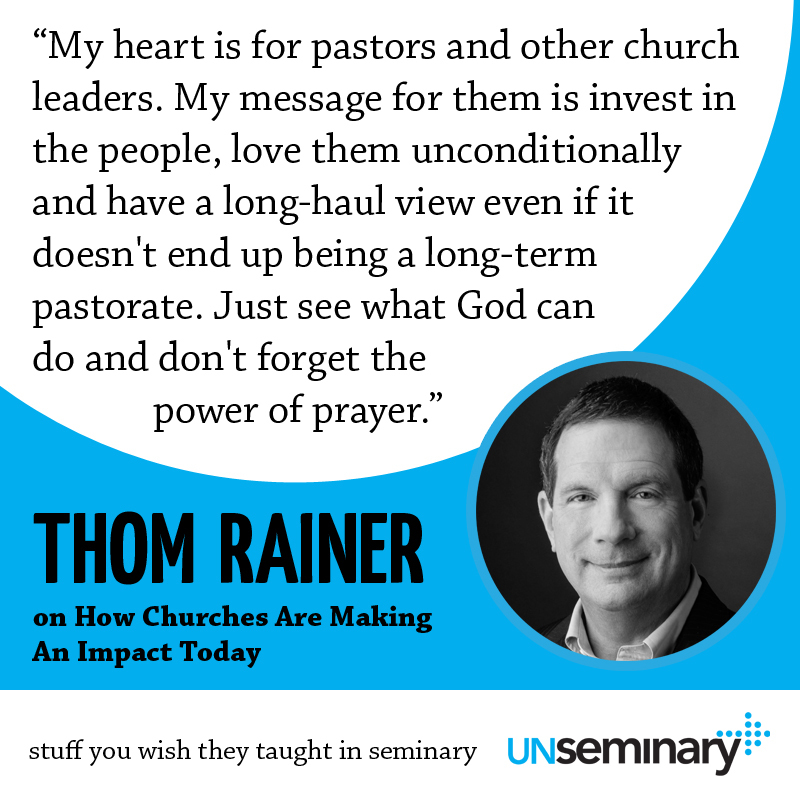 The thing I appreciate about you, not only are you helping church leaders, you have such a passion really for church leaders, because of some of your background, why don’t you give us the Thom Rainer story? Thom – Very quickly. Out of college, I went into the family business which was banking and so I was the fifth generation banker. Never had been a vocational minister in our family, in fact, I don’t think we were very church active for several generations. The story of my collar is a story unto itself, so I’m not going to go there, but I left the banking world and went to seminary. So we packed up. I had not been admitted. We, my family of then four, had not been admitted, didn’t have a place to live. I packed up and didn’t have a job and so I went from the fast corporate track to unemployed. First job was a janitor at famous recipe fried chicken. So things changed quickly. From seminary, four pastorates: Kentucky, Indiana, Alabama and Florida, and then from those four, because I got an advanced degree my alma mater called me back and asked me to be Dean of a school at seminary. So I did that, so after that four pastorates, it was during that time Rich, that I was also working with my side venture, which was consulting churches. I really had begun it, even while I was a pastor, but because of the nature of academia I had more available time to blossom that. I was able to consult with several hundred churches, 5 or 6 hundred churches during that 12-year period. Thom – Then came to LifeWay, where I am now. LifeWay, for your listeners… and again I’m not trying to do bragging rights, but I think it’s the largest Christian company in the world. We have about 5 thousand employees scattered all over the place. I am based in Nashville and we make Christian resources and we sell Christian resources. So that is the minute and 27 path. I went over my allocated minute. Rich – No, I appreciate that Thom. One of the things I just want to say is thank you to your service to the broader body of Christ. You’re one of those leaders that I look to and I really appreciate the work that you do. Obviously, not only at LifeWay, you guys do a lot of incredible work, LifeWay Resources, Research, all kinds of great things and we’re just honored to have you here today. Often at times we make a reference here at unSeminary to the fact that 94% of church are losing ground against the growth of the communities they serve. So we’ve picked an interesting market, for lack of a better word to work with, to be in. A lot of our brothers and sisters are losing ground against the communities they serve. What do you believe are the major contributions to this reality to churches today? Thom – There would always be several and I would not want to minimize the spiritual realities, so let me begin there, but then let’s go to some practical realities as well. Some of the spiritual realities is, many of our churches are prayerless. We give lip service to prayer any time there’s been a great significant growth in the church. Historically it has been preceded by significant, not programmed prayer, but just a burden for prayer. For whatever reason that is not existing. But then once we get beyond that, I don’t think many of the reasons beyond that platform reason, that base reason, are necessarily theological or biblical in the classic sense and those have to do with leadership and relational skills. A lot of our pastors, a lot of our staff persons and they say this and this is not any type of denigrating statement that they say this: “I have not been trained to lead a church with a quarter of a million-dollar budget, or a half a million-dollar budget. I have not been train to lead multiple staff. I don’t know how to deal with the person that’s constantly on my case.” Those types of things can so… they may end a pastor of staff’s ministry, but at the very least they distract a person from that main focus that they should have. So what you do, or what I do, is we’re trying to fill a void. It’s not necessarily a void created by the seminaries, but it is a void that is there and so without these types of basic leadership relational skills that takes place. There’s a third factor and as I said, prayer, the basic skills of leadership and relational skills and then the third factor is this: There is not a lot of intentionality. When I wrote a book called the, The Unchurched Next Door, many years ago, part of the research in it was that only 5% of unchurched people are resistant to an invitation to church. 95% are either receptive or neutral and we have this false narrative that is taking place in many of our churches that we cannot and it goes to the leaders, it goes to the members and many times we have surrendered. Rich, I remain an obnoxious optimist about the church. Thom – Despite the fact that it’s 90 plus that are losing ground in their community, I believe, because I’m seeing things happening that I think can be more pervasively understood across North America and that’s where I focus more than anywhere and I just have hope in the midst of what seems to be a rather challenging scenario. Rich – I appreciate that and that’s what I appreciate about you and I resonate with that. I’m in the same boat, I really do, I love the challenge that we have. I’ll say to other church leaders, “You know, God picked you to lead at this moment,” which is pretty incredible. Rich – Let’s talk a little bit about that. How are you seeing churches engage with the cultures of their communities, in a way that doesn’t compromise the message of Jesus, they’re able to connect with their community, see people reach out to the unchurched, but do that in a way that doesn’t compromise with the message? Thom – The millennial generation is teaching me a lot. I don’t know what year you were born, but I have three sons that were born between 1980 and 2000, which is the millennial generation, about 78 million, the largest generation in America’s history. That generation has taught me that true ministry, true evangelism, that has credibility and integrity behind it, is built upon relationships, is built upon connecting with other people. I’ve watched my son, who is a church planter, and I’ve joined his church because it’s in the Nashville area, and I’ve watched him and people in that church develop relationships and some people will say, “Tell me what’s different about your… or tell me what’s going on,” or they’ll come to church and they’ll hear a clear gospel message. There’s always the swing of the pendulum Rich. In the turn of the 20th century there was really a lot of good deeds with our gospel and then the pendulum swung the other way and there was the gospel message, without the gospel life. And now what I’m seeing happen is, we’re seeing them come together and we’re seeing relationships that then give us the opportunity to connect with people. So we’re seeing churches that are following along, that are saying, “I want to get into community, I want to make a difference,” and this isn’t just about some type of memorized presentation, but the gospel is present in many of the things they say. Rich – Absolutely, that’s amazing. I really have seen that. I have a friend of mine, would be millennium leader who’s planting a church right now, literally as they’re speaking and for him it’s very clear that it is both about the demonstration and the proclamation of the gospel. They’re worried about, kind of the traditional thing. I’m a Gen Xer, I’m in that 1974, literally at the very bottom of the boom and then the bust. There was the least amount of people born in the year I was born in our country. Rich – But his church is interesting, because they really are trying to do both and hold both very high, which is incredible. Are you seeing that as a trend, this kind of community service orientated kind of evangelism, for lack of a better word, as a trend across the broader church today? Thom – I’m seeing a trend across more younger churches, and I’m hoping that will become an influencer of the older more established churches. I have kind of a mentoring ministry to pastors and others as well and many of the older pastors, now older, I’m a 61-year-old, or I’ll be a 61-year-old, so I’m not talking about necessarily as old as I am, but from the mid-40s and up and they’re asking questions about, “What do I need to be doing? How do I need to change?” So there’s an openness to this older leadership to do the things that some of the younger leadership is doing. And I’m hoping that the training of the experience and the training of what I’m doing currently can flow both ways. Rich – Very cool, very cool. Well changing tack a little bit, if you were staring out in ministry today, you stepped out after seminary, and going back into that first pastorate, knowing what you know today, what would you have done different when you started out in local church ministry? Thom – Gosh, almost everything. The first thing I’d do is fire me, because I know I’m not competent to lead a church. I mean, one of the reasons I’m not there is because there’s so much about being a pastor and being a leader of a church, it’s one of the toughest jobs in the world and I would doubt my own competency. I told Nellie Jo, my wife, one time that I was thinking about writing a book of that, the mistakes I’ve made in ministry. She said, “No, that would be a multivolume series.” I have not gone that path. Thom – Now I’m not advocating that you’re not supposed to leave your church after three or four years, but unless you’re going into a clear situation, where you know you’re going to leave, like maybe a small rural church that while you’re at bible college or seminary and you know, “Okay, when I graduate I’ll leave there,” I made the mistake in my other churches of saying, “Okay, I’m coming to this church and what’s next?” Instead of saying, “What now?” and I was never present enough and climbing the ecclesiological ladder or looking to the next thing, those were some of the biggest mistakes I made. Which mean, I never really invested in the community, because in the back of my mind, I wasn’t going to be in the community long. Rich – I hope that encourages leaders who are listening in today. I know there’s a lot of church leaders and pastors who do find themselves maybe a little bit discouraged and you can pull back from your people, maybe not physically, but even just emotionally and mentally and you begin to put distance, which then becomes a viscous cycle. We know that right? It pushes and then ultimately you do, I appreciate what you’re saying there, we have to lean in on the communities that we’re in today. This is where God’s called us today, let’s do that. Rich – Who are you learning from these days? You’re a leader that a lot of people look to, what are some other churches or organizations, it can be anything, it could be a Christian organization or not, that inspires you and motivates you? Thom – I have to say this. I have a network that is a very natural network of pastors and church leaders through an organization called Church Answers. It is basically a subscription based mentoring and different levels of mentoring. You would not recognize the churches most likely and the leaders that are inspiring me, because they do not have the marquee that a lot of others do. I’ll give you one example. He has the classic name for a pastor, his name is Chuck Angel. Rich – You can’t make that up. Thom – “He’s just an angel,” and he is the pastor of a church called Foundry in the Denver area and Chuck got there, the attendance had been 186 to 190 for about 12 years, that right range of average attendance. And now, against the human odds that people said it couldn’t be done, the church is at 500, 600. Thom – And it’s a storefront church and they’re doing things that are… many times countercultural means that we do things that are new, he’s doing some countercultural things that are kind of retro and he’s reaching some people, when they said it could not be done, highly relational, highly connected with people, but methodologically he’s just a genius. So the world does not know Chuck Angel, maybe a few more will know him after this podcast, but that is a clear example. The blogosphere and the podcast world has some select leaders that are really putting out some good stuff. You’re one of them. Thom – More on the established church level, Carey Nieuwhof. Rich – Fantastic, he is great. Thom – I read his stuff continuously. Although Ron Edmondson doesn’t, in my opinion, put out enough of the information. He is one of the best and he has taken a long established church in Lexington, Kentucky and turned it around and I read everything that he writes. You know, what I want to see is, I want to see more of the “Rich’s” out there, because the field is not crowded enough. We need more people speaking into the leadership of churches on a very practical level. There’s a lot of people speaking into it on a theological level, but on the practical application, I’d like to see a lot more. Those are just a few examples. Rich – I appreciate that, thank you. Yeah some great leaders and a number of those guys have actually been on the great podcast, great stuff for sure. Well Thom I really appreciate you being on the show today. Anything you want to say in parting, to our listeners? And then how can people get in touch? I want to make sure they tune into your podcast, one of the best, I love it. Literally, when it comes up, boom I listen to it. Rich – So How can people get in touch with you? Thom – Okay, thomrainer.com and that’s thomrainer and there’s another story unto itself. thomrainer.com is the blog site and if you go to the blog site we will be posting the podcast there as well. Of course it’s an iTunes podcast as well as other servers and Rainer on Leadership is the name of it. But thomrainer.com is the main way. And Rich, my heart is for pastors and for other church leaders and I think the reason is, I was such a lousy one that I want the best for them and I’ve experienced the pain, a lot of it self-inflicted. My message for them is, invest in the people, love them unconditionally and have a long haul view, even if it doesn’t end up being a long term pastorate and just see what God can do and don’t forget the power of prayer and organizing your people, that they may be more intentional about prayer as well. Rich – Thank you so much Thom. I really appreciate you being on the show. I hope you have a great rest of your day. Thom – Thanks Rich, it’s been great to be here. Rich Birch is one of the early multi-site church pioneers in North America. He led the charge in helping The Meeting House in Toronto to become the leading multi-site church in Canada with over 5,000+ people in 18 locations. In addition, he served on the leadership team of Connexus Church in Ontario, a North Point Community Church Strategic Partner. He has also been a part of the lead team at Liquid Church - a 5 location multisite church serving the Manhattan facing suburbs of New Jersey. Liquid is known for it’s innovative approach to outreach and community impact. Rich is passionate about helping churches reach more people, more quickly through excellent execution.His latest book Church Growth Flywheel: 5 Practical Systems to Drive Growth at Your Church is an Amazon bestseller and is design to help your church reach more people in your community. All About Multisite // Coaching to Help Your Campuses Thrive This Easter!